As one wise man once said, “There are never problems, only solutions.” Even though we don’t live in the sprawling countryside, you can still enjoy organic, homegrown vegetables and fruits from the convenience of your patio. We don’t always have the option of moving out into the sprawling countryside to live off of the land. Our jobs dictate that we live near a city and, as a result, our yards are smaller and may not provide adequate space for a large garden. As well, those that are renting homes may also be limited on what they can do with a yard. Patio or container gardens are a great solution to this issue. You can grow fruit trees, herbs, vegetables and fruits from the convenience of your patio while using underutilized space. As well, walls and window boxes can grow herbs, vegetables and fruits to make use of vertical space and provide you with a lovely focal point. 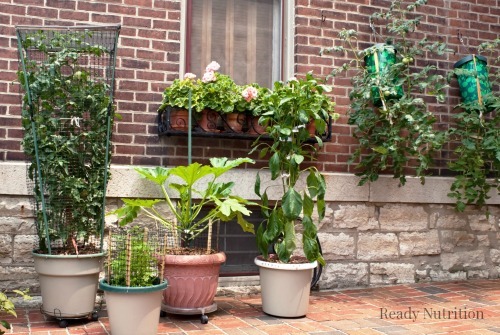 Do some research on your part to determine what the best type of small space gardening is best for you. There is an unlimited amount of solutions you can find for this type of gardening on YouTube. As well, ensure that your pots and containers have adequate drainage holes at the bottom. Plants do not like to sit in soggy soil and quickly develop root rot, as a result. Planting shallow-rooted plants such as small herbs, green leafy vegetables, strawberries, and green onions can be grown close to one another and will help plant roots stay shaded from the hot sun. This is a principle of xeriscaping and will also help to cut down on watering. To keep plants healthy, water only when soil feels dry. The best way to determine when to water is to insert your index finger 2-3 inches into the soil. If the soil feels dry, it needs water. If it is still moist, then it can go another day until it needs to be watered. Quality soil is essential in growing container plants. Because the plants will not get getting essential nutrients from the ground, you need to ensure that the soil you use is suitable for containers. Perlite, vermiculite, calcined clay (kitty litter), and sand are the mineral aggregates most commonly used in potting soils, and adding these would be beneficial to the success of your garden. The following is a mix that can support container plants for a year or two without additional fertilization. What Kind of Plants to Grow? Growing compact plants with smaller root systems is another way to garden in small spaces. 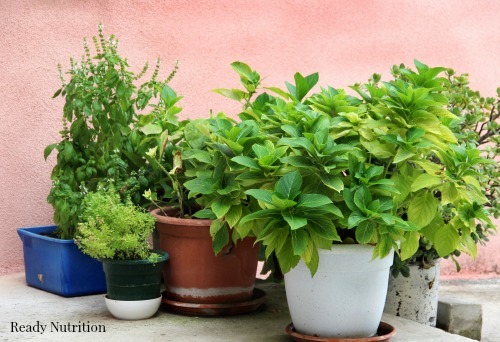 Many herbs such as oregano, rosemary, thyme, lavender and sage will continue growing in most parts of the country and do not need to be replaced each season, thus making them wonderful additions to a year round patio garden. As well, consider adding some colorful flowers such as petunias, marigolds, or roses to attract beneficial insects to help pollinate your patio garden. On a personal note, even though I have an area of my yard devoted to larger-scale gardening, it is simple not large enough for what I want to accomplish, and I have decided to extend my garden on a back patio. This is the area where I have my herbs, lettuces and bush variety vegetable plants growing. I have found that I prefer container gardening because weeds are less likely to invade the growing space and the plants are so close I pay more attention to how they are growing. I have utilized a lot of grow bags in my patio garden. In the grow bags, have planted potatoes, onions and strawberries and they are really doing great. I have my herbs and radishes planted in ceramic containers. My green beans, tomatoes and cucumbers are still not ready to be set out, but I plan on using 5-gallon plastic containers for them. As one wise man once said, “There are never problems, only solutions.” Even though we don’t live in the sprawling countryside, you can still enjoy organic, homegrown vegetables and fruits from the convenience of your patio. This small investment will help your family save money at the grocery store, eat more healthy and have a lovely scenery to enjoy during the summer months.